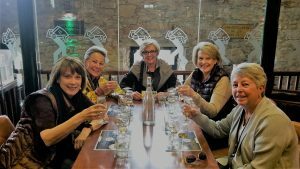 Our visit to Ireland made clear why Irish eyes are smiling – friendly people, a pint of Guinness and perhaps a tot of Jameson’s gives the world a roseate hue. 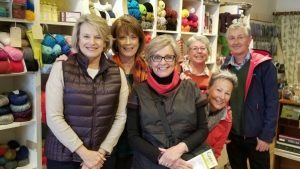 We experienced all of that during the second part of our trip which focused on knitting – a passion we all share to the point of needing a 12-step program. 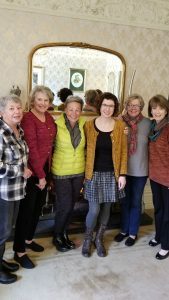 After our evening at the Celtic Whiskey Lounge and Sheehan’s Pub we sobered up the next morning for our class with Carol Feller. As I wrote in my previous post, Carol Feller and Kieran Foley (more on him in a moment) are the equivalent of playing golf with Rory McElroy or Padraig Harrington. I should note here that the Killarney Park Hotel was truly one of the finest hotels I’ve ever visited. They are five star not only for their accommodations and food, but for their outstanding service. On the morning of our class they provided us with a cozy room with a wood-burning fireplace and brought coffee for our enjoyment – all free of charge. Carol spent more than three hours with us and was not only informative, but charming as well. It seems to be an Irish trait. Most of us have been knitting for decades but Carol provided us with some new tips and techniques, proving that you CAN teach an old dog new tricks. Some of our group had pre-ordered yarn from her while others said they would abstain. After three hours with Carol everyone ordered mounds of yarn. So much for willpower. 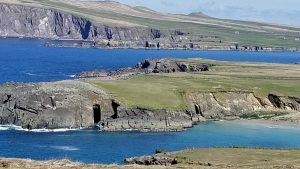 The following day we climbed into Jack’s van and embarked on a tour of the Dingle Peninsula. The scenery, like everything else we’d seen in Ireland, was spectacular. The little town of Dingle is touristy and quaint at the same time. It was here we experienced more Irish hospitality. One member of our group stumbled and skinned her knee so we sought out first aid materials. The local pharmacist didn’t just sell us the bandage and antibiotic ointment, she took it upon herself to clean and dress the wound herself. Heck, I can barely get the staff at my local Walgreens to point me to the bandaid aisle. The waters surrounding the peninsula are crystal clear and the hillsides verdant, as one would expect in Ireland. We had the opportunity to stop and pet some newly-minted lambs but, cute as they were, we declined. I was struck by the many historical churches that remain along the route. 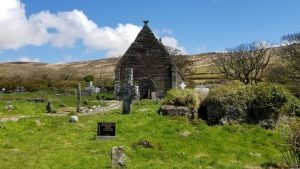 One is the Gallarus Oratory, a simple dry-stone structure built in the 12th century that has remained waterproof and in near-perfect condition to the present day. Just as interesting is the Kilmaekeder Church, built in the mid-12th century on the grounds of a previous structure built in 636. A stone from that period still sits on the alter. The church grounds are filled with gravestones, some ancient and some rather recent (in fact one poor sod hadn’t actually been buried 6 feet under yet as the family was waiting for the headstone). There were tributes to Irishmen killed by the English during The Uprising as well as markers for whole families that included listings of those who went to America and were lost at sea. Once back in Killarney we traipsed over to dinner at the Ross Hotel’s Lane Café Bar. The service was slow but the food was delicious. I’d recommend it if you’re not in a hurry. The following day was our “marathon” day to Dublin. The kind people at the hotel had a bag of pastries and fruit waiting for us as we left for the train station at 6:10 a.m. The train service to and from Dublin was wonderful – clean, fast, and quiet. Once in Dublin we headed for The Constant Knitter shop where we had a private trunk show with designer Kieran Foley. Again, he was as kind and generous a person as one could hope to meet. Are there any crabby people in Ireland???? Kieran brought out an array of his designs which are so complicated and intricate that I’d only contemplate starting one prior to entering the insane asylum. Each piece is reminiscent of an Oriental carpet or fine piece of fabric. We left him inspired to “up our game”. After buying scads of yarn we we went in search of a great spot for lunch…and beer. 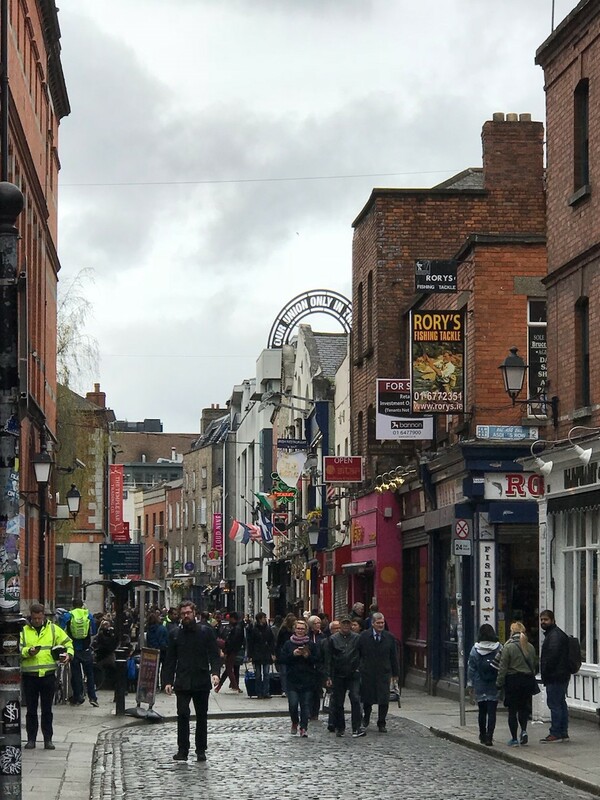 We ventured up to the Temple Bar area of Dublin (the featured picture this week) which is a hopping place, full of tourists and locals alike. There is no end to the dining possibilities but we chose Boxty, which received rave reviews on Trip Advisor. Once we were sated with Smithwicks lager and fish and chips we ventured to This Is Knit yarn shop. The store is elegant in design and content, located in the Powerscourt Townhouse building, a former mansion that has been transformed into a fabulous shopping center with a central atrium and boutique shops. We bought more yarn, despite our resolve to be on a “yarn diet”. From there we walked 40 minutes back to the train station for our return to Killarney. When we dragged into the hotel at 8:30 p.m. we were greeted by hotel staff inquiring about our day and asking us about what we saw in Dublin. I’m not sure they are used to anyone making Dublin into a “day trip”. Morning came too soon when we once again traveled in Jack’s van to Kinsale and Cork. Kinsale is a darling seaside village, filled with cute shops and an outdoor market. We could have spent several days there. We ambled in and out of the stores, buying knick knacks and two people bought beautiful leather purses fashioned by a local designer. We relied on Trip Advisor again and ate lunch at Fishy Fishy, where we continued our quest of the perfect pairing of lager and fish and chips. Next we headed to Cork to visit Hedgehog Fibers. Hedgehog is a very popular yarn, more so in the States than in Ireland. In fact, we learned from all our Irish knitting contacts that the Irish like to spend money on food and drink, but not on yarn. We bought MORE yarn (by now we were contemplating buying extra luggage) and then headed out to the Jameson Whiskey Distillery. We decided to go for broke, splurging on the premium whiskey tasting. It turned out to be a wise decision. We were taken to a private room where a young woman gave us the particulars of each whiskey we sampled. I was tempted to chug one down but she instructed me that I needed to savor the banana, oak, berry, vanilla, honey, etc. Geez, it all just tasted like whiskey to me. I don’t think I’m sophisticated enough to taste premium whiskey. As we finished up she kind of chuckled and said, “I’ve worked here four years and have never had an all-woman group before.” So…I guess we broke the glass ceiling for whiskey tasting! Next week – castles and some final recommendations. Slainte!